(Rose M. de Forest [Mrs. Augustus de Forest], New York); sold 17 December 1926 to Thomas B. Clarke [1848-1931], New York; his estate; sold as part of the Clarke collection 29 January 1936, through (M. Knoedler & Co., New York), to The A.W. Mellon Educational and Charitable Trust, Pittsburgh; gift 1947 to NGA. The provenance provided by Mrs. de Forest was from the supposed sitter Oliver de Lancey's nephew Stephen de Lancey, North Salem, Massachusetts, to his wife Hannah Sackett de Lancey (1751-1836), who later married Isaac Baldwin, of Litchfield, Ct. and Pompey Hill, N.Y.; his daughter Julia Titus (b.1825), Geneva and Albany, N.Y. The same false provenance to Julia Titus was used for thirteen paintings (see Anna W. Rutledge and James W. Lane, "110 Paintings in the Clarke Collection," manuscript, 1952, NGA curatorial files, 41-65.) Examination by Lane and Rutledge of documentary records of these individuals, including wills, inventories and other papers, turned up no mention of family portraits or of such an extensive family portrait collection. The provenance and identification are now regarded as fictitious. A Loan Exhibition of Paintings by Early American Portrait Painters, The Century Association, New York, 1928, no. 1, as Oliver De Lancey by Henry Benbridge. Portraits by Early American Artists of the Seventeenth, Eighteenth and Nineteenth Centuries, Collected by Thomas B. Clarke, Philadelphia Museum of Art, 1928-1931, unnumbered and unpaginated catalogue, as Oliver De Lancey by Henry Benbridge. 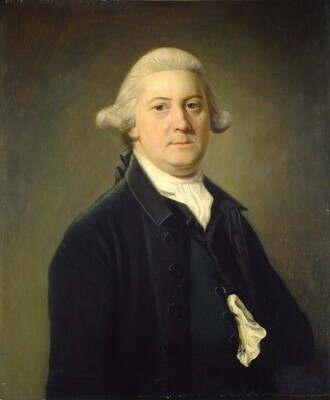 Henry Benbridge (1743-1812): American Portrait Painter, National Portrait Gallery, Washington, 1971, no. 56, as Unknown Gentleman II by Henry Benbridge. A Loan Exhibition of Paintings by Early American Portrait Painters. Exh. cat. The Century Association, New York, January 14 to February 2, 1928: no. 1, as Oliver de Lancey by Henry Benbridge. Portraits by Early American Artists of the Seventeenth, Eighteenth and Nineteenth Centuries, Collected by Thomas B. Clarke. Exh. cat. Philadelphia Museum of Art, 1928, unnumbered, as Oliver De Lancey by Henry Benbridge. American Paintings and Sculpture: An Illustrated Catalogue. National Gallery of Art, Washington, 1970: 16, repro., as by Henry Benbridge. Richardson, Edgar P. Review of Henry Benbridge (1743-1812): American Portrait Painter by Robert G. Stewart. In The Pennsylvania Magazine of History and Biography (1971): 95, 549-550. Stewart, Robert G. Henry Benbridge (1743-1812): American Portrait Painter Exh. cat. National Portrait Gallery, Washington, 1971: 19, 55, cat. no. 56, as Unknown Gentleman II. American Paintings: An Illustrated Catalogue. National Gallery of Art, Washington, 1980: 28, repro., as by Henry Benbridge. Williams, William James. A Heritage of American Paintings from the National Gallery of Art. New York, 1981: 17, repro. 18, as by Henry Benbridge. American Paintings: An Illustrated Catalogue. National Gallery of Art, Washington, 1992: 32, repro.